most of them originating in the (mistaken) belief that the round towers could not have been erected by Irish builders. Regardless of their origin, the round towers are one of the most intriguing of Ireland's man-made wonders. The Buddhist Phalli of Ireland? One of the most far-fetched explanations for the impressive Irish erections was provided (or rather dreamt up) by the Orientalist Henry O'Brien in 1832, totally hooked on Eastern culture and philosophy. In a long and winding treatise, he came to the conclusion that the pillars of stone were the visible legacy of a phallocentric Buddhist cult. 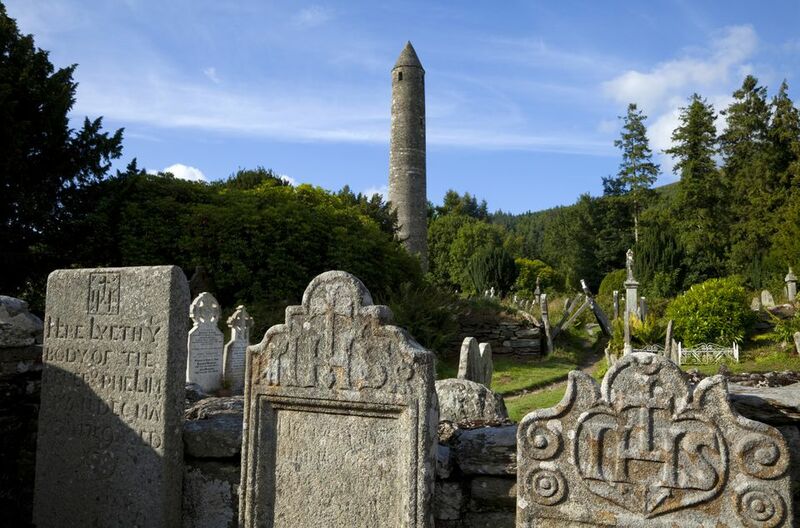 According to O'Brien's version of history, Ireland once had an influx of Buddhist immigrants who raised the round towers as places of phallic worship. This happened before Saint Patrick, obviously. Notwithstanding logic, missing evidence, and the simple fact that round towers were erected well past Patrick's time, the Royal Irish Academy granted O'Brien a price of £ 20 for his work. To be honest, the Buddhist theory was not the first time a “foreign” background to the Irish round tower was suggested. In 1724 Thomas Molyneux published "A discourse concerning the Danish mounts, forts, and towers." His theory in a nutshell: Danish Vikings built the round towers after arriving in Ireland. Again the time frame does not fit the theory, Viking invasions happened after the first round towers were built. And no hard facts support Molyneux' theory. In fact, one blatantly obvious problem was conveniently overlooked. This being the non-existence of anything remotely resembling an Irish round tower anywhere in Denmark (or Northern Europe and Scandinavia in general). A passing nod must go to other civilizations importing round towers into Ireland. Amongst which were "African Sea Kings"--the Phoenicians, the mysterious "sea peoples," and similar folk. While there may have been trade between Africa and Ireland, this still does not fit any historical time frame. "Ancient Astronauts" also got a foot in; after all, round towers bear an uncanny resemblance to a rocket, and in 1054 a "round tower made of fire" was seen over Meath. Does Nazca-interpreter Erich von Däniken know more? And then there are the Zoroastrians. These fire-worshippers lit their sacred flames in Ireland too (some think), on the round towers they had especially built...but, unfortunately, left no further trace of their stay. What connects these theories, apart from being on the lunatic fringe? The subtext: Irish builders could not have been able to construct the round towers without outside help. Early Irish Christianity certainly took on influences from the East and was a different way to mainstream Roman Catholicism. The Irish ideal was a monastic, quiet life somewhere out of the way. Irish monks liked to be left alone and some may even have tried to emulate the stylites, living saints living on pillars. Hence the round tower was considered as a place where a stylite lived. Apart from missing evidence that anybody ever lived permanently in a round tower...the very concept of an ascetic life as a stylite goes against this. A single man living in round tower would have been akin to modern hermit occupying the Empire State Building on his own. Sooner or later a cosmological explanation was bound to spring up, and the round tower as the centerpiece of a gigantic sundial makes at least some sense. Unfortunately, no evidence of an actual “dial” matching this theory can be found. And it may well be asked whether a stick in the mud would not have served the same purpose for less cost and effort. On the other hand, the theory cannot be totally discarded: A monk in the upper chamber may well have kept an eye on the moving shadow of the tower and deducted the time of day from it. When the shadow falls on Brother Leo's grave, it is time for lunch. It seems to be preposterous, however, to suggest that the towers were built for this purpose. The same problem is faced by the fringe theory that the towers were built as vertical ossuaries, bone-houses. This seems to be supported by the skeletons found in some towers, but nowhere was a veritable mass of bones discovered, all finds were of small measure and without consistency. It is, therefore, more likely that these bones were the remains of people actually killed in the towers ( somewhere burnt with occupants), of people interred before the foundations were laid or simply discarded bones from other graves. And there is always the possibility that a shrine was kept in the tower. It is more than likely that the towers would have doubled up as observation platforms to warn the monks of approaching raiders, thunderstorms, and tax collectors. If you have a tower, why not use it? But, again, nobody would have built a round tower just for this purpose. Closely connected to the look-out is the theory of the round tower as a defensive structure. This likens the slim round tower to the more or less squat donjon of medieval castles. It falls down on purely practical grounds: missing arrow slits and other military details would have rendered the tower useless for that purpose. The round tower is often seen as a safe refuge for monks, and this certainly was true at times, some annals tell of a dash for the tower with enemies approaching. Undoubtedly the round tower was the most massive part of a monastery, suggesting a safe haven. Unfortunately, most annals continue to relate that the round tower was then burnt by the attackers, leading to the most unpleasant death of those seeking refuge therein. Round towers may have been a deterrent for the odd marauding band without ambitions. Those wanting to make a killing would simply have to light a decent fire and then wait until the chimney-like tower became a roaring furnace. Picking through the charred bones of molten gold would have been easy afterward. Round towers were high and dry and it would have been a waste of space not to store some valuables in them. These would have been safe from the elements, rodents, and even the odd passing thief. But not from determined raiders (see above). The occasionally heard theory that the round towers were a “hiding place” for valuables seems to be pure fallacy...unless you define as a “hiding place” the only building a one-eyed and severely myopic Viking would be able to spot in fog and rain. Occam's Razor? Multi-Purpose Bell Tower! The Irish word for a round tower is "cloicteach," literally “the house of the bell” and used in annals written when round towers were all the rage. Let us be blunt then, in assuming that the round tower was a bell tower or “campanile.” Not only used to house a bell but also used to ring it from the upper floor. Even small bells test-rung there can be heard from a mile or more away. Though we have no evidence that a rope was used to ring the bell from the lower floors, this is not only possible but would have been the most practical way to go about it. Unfortunately, even the just applied Occam's razor won't cut to the chase here...we simply do not know and it is unlikely that we'll ever find out. The Irish round tower is a unique piece of ecclesiastical architecture that only flourished in Ireland. But, who built the first one and whether it was inspired by vaguely similar European buildings, so your guess is as good as mine. A Doctor Who Question Answered: Gallifrey, is That in Ireland? Need an Airline to Fly You to Ireland? Choose Wisely!